From the edges of waterfalls to high above mountain ranges - drones have captured some beautiful images all over the globe. But this video captured by a whale watching tourist off of Newport Beach, California is one to be reckoned with. 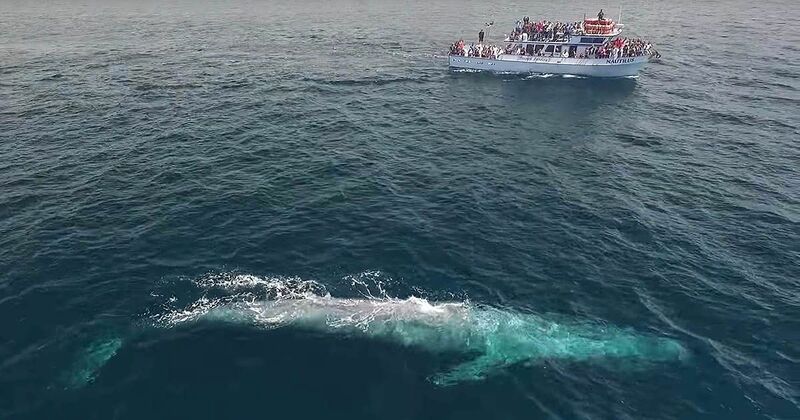 In an incredible piece of video footage, you can see that a ship packed with whale watchers is dwarfed in comparison to the giant who swam past - the largest creature on earth, the blue whale. The owner of the video says the whale watching ship was 72 feet long - and packed with over 100 people. By no means was this a small ship - yet, next to the gentle giant you can begin to understand just how massive these creatures really are. The owner of the video estimates the blue whale to be about 90 feet in length. If you still can't wrap your head around the sheer size of this animal, the World Wildlife Foundation says these creatures can grow up to 200 tonnes. To put it into perspective: an adult male African elephant weighs 6 tonnes. Check out the incredible video below and be amazed for yourself.